Political officials predict that Labor MK would lose support in the wake of the investigation against him. Israeli political officials predicted on Friday evening that MK Binyamin Ben-Eliezer’s bid for the presidency was likely over in the wake of the investigation against him. While Ben-Eliezer is not expected to withdraw from the race, officials who spoke to the Hebrew-language Walla! news website said that the investigation would likely take away votes by MKs who were still unsure who to vote for. Ben-Eliezer was questioned for five hours on Friday on suspicion of receiving funds illegally. The questioning lasted for five hours, following which he was released. He is reportedly suspected of having received large sums of money from several factors, including from wealthy businessman Avraham Nanikashvili, who was recently questioned in connection with another case related to corruption at the Ashdod Port. Two MKs who spoke to Walla! after reports of the questioning surfaced said they would likely support one of the two presidential candidates who have never been MKs - Nobel Laureate Professor Dan Shechtman or former Supreme Court Justice Dalia Dorner. The MKs explained that they would support one of the apolitical candidates due to the public’s growing disgust with the way the race has been handled. According to Walla!, members of Ben-Eliezer’s Labor party who almost unanimously declared their support for him (Shelly Yechimovich being the exception) felt a great unease on Friday evening after reports of the allegations surfaced. "The race is finished for him," said one member of the party, while others were more cautious and speculated that Ben-Eliezer will only "lose a few votes." 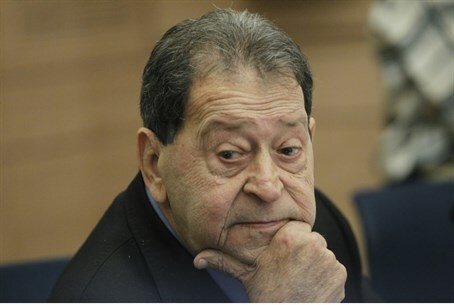 In addition to Dorner and Shechtman, reported Walla!, former Knesset Speaker Dalia Itzik and MK Meir Sheetrit (Hatnua) may also benefit from Ben-Eliezer’s latest predicament. According to the report, Itzik is on good terms with Shas Chairman Aryeh Deri and may gain some votes among MKs from that party. As for Sheetrit, analysts believe that he could receive additional votes if some MKs who planned to vote for Ben-Eliezer shift their support to Sheetrit. In any case, MK Reuven Rivlin (Likud) is enjoying a lead in the race and, should a second round of voting be required, analysts predicted that Rivlin would win.